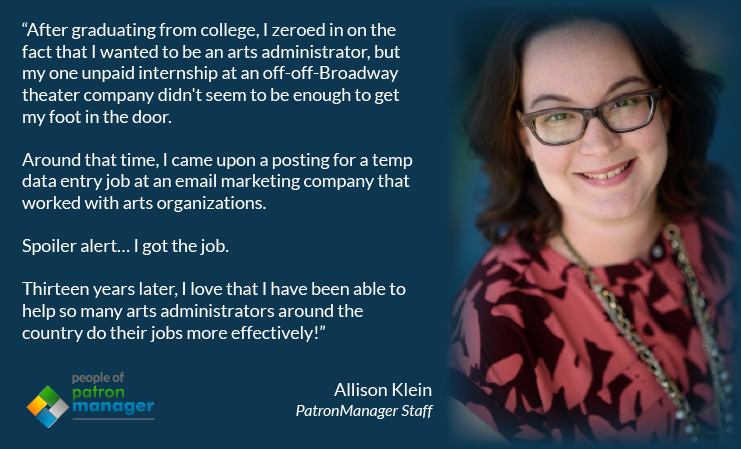 Here at PatronManager, our backgrounds are as diverse as the city we’re based in, but we have one thread that ties us all together — we are passionate about arts, culture, and live entertainment and want to see these industries succeed. In fact, the majority of our staff come from backgrounds in the arts; theatre, opera, improv, and the visual arts (just to name a few). While our offices are located in the heart of the theatre district in New York City, many of our positions are flexible and come with the opportunity to work remotely. Wherever our staff is, the goal remains the same, to provide our clients with integrated world-class customer relationship management, box office ticketing, fundraising, and marketing technology, all rolled into one system, which is built entirely on the world’s most advanced cloud-based CRM platform — Salesforce.